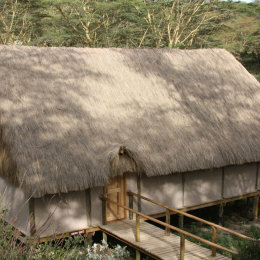 Malewa Wildlife Lodge is located in Gilgil, situated in the Kenya's Great Rift Valley, about 120 Kilometers from Nairobi along the Nairobi to Nakuru highway. The Lodge is set within a glorious yellow fever tree woodland along the Malewa river which attracts over 250 species of exotic birds. 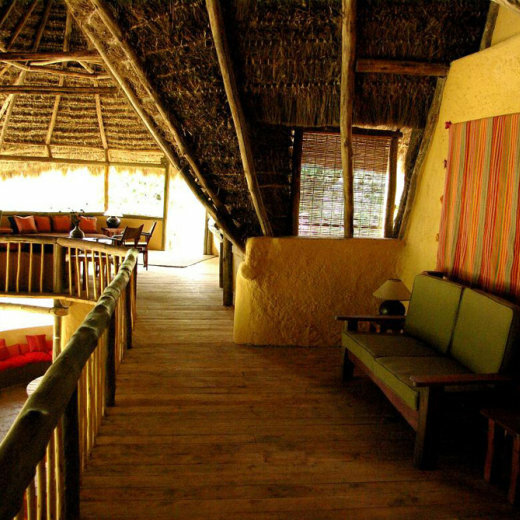 Once a rudimentary lodge, it has been transformed into a stunning eco lodge incorporating a dramatic architectural style and traditional African building methods and concepts. The area is a beautiful double storey structure made up of a massive thatched roof covering games and relaxation areas on the upper deck and a lovely communal sitting area with fireplaces, dining room and bar on the ground level. There are 5 individual traditional styled buildings with 6 bedrooms, one is a 2 storey family cottage with 2 rooms and 4 stunning river suites on stilts including one honeymoon suite with an outdoor bath, all offering spacious bedrooms with en-suite bathrooms within an acacia forest filled with wildlife and birds. The beautifully decorated double storey is framed by yellow fever trees and fronted by the Malewa river surrounded by several sitting areas. upstairs there is the reception and 'chill room' for children, downstairs there are 2 circular sitting areas with fire places, dining room and a bar.